Yes I am on a macaron baking spree. 🙂 You will as well once you get the recipe right. 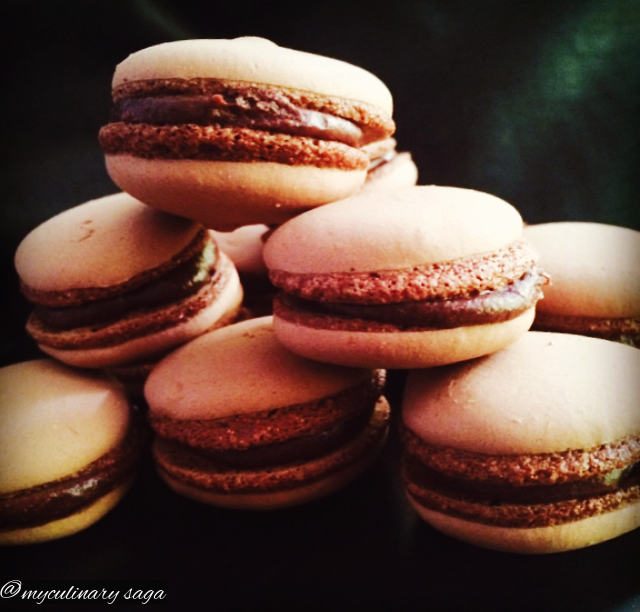 For all the chocolate lovers out there, here is another variation of the simple macaron recipe I wrote earlier. Check the Strawberry Macaron recipe if you haven’t already. Nothing much to say or write here so I just let you jump straight to the recipe. 🙂 Have fun! Weigh by an electronic scale – the ground almonds, cocoa powder and sugar. Sift this together and whisk until well combined. Pour the cocoa and almond mixture into the meringue and fold with a spatula. Stop folding when the surface of the batter starts to be shiny. This usually takes about 35 folds. Preheat the oven to 150 degrees C. or 300 F.
To make the filling, put chocolate into a heatproof bowl and gently melt over a pan of barely simmering water. Stir in the warm cream until smooth. Leave to cool and thicken. I was happy with the outcome. I would have preferred a darker and shinier top but this was good enough for me. I hope you give it try as well. Enjoy! Beautiful..macarons are really difficult to make and you have nailed it perfectly!! Thank you so much dear 🙂 yes I am really feeling proud. Thanks Lauren 🙂 do let me know how it turns out.. ! Hugs! Thanks for acknowledging that Linda 🙂 this especially is like an achievement ! So good to know you Linda. All power to you too!